When John F. Kennedy was inaugurated 35th president of the United States, he was the youngest person and the only Catholic ever elected to the nation’s highest office. Elected with the narrowest of margins by a nation fearful under the dark cloud of the Cold War, Kennedy summoned fellow citizens with his inaugural call to commitment and sacrifice: “Now the trumpet summons us again to…a struggle against the common enemies of man: tyranny, poverty, disease, and war itself…And so, my fellow Americans: ask not what your country can do for you; ask what you can do for your country.” Kennedy seized the momentum of his inauguration and tackled some of the nation’s most pressing domestic and foreign policy issues during the first one-hundred days of his administration. Though an assassin’s bullet ended Kennedy’s life in Dallas in November, 1963, before the realization of many of his far-reaching reform initiatives, his successor, Lyndon B. Johnson, won passage of the civil rights bills and voting rights laws, federal aid to education and Medicare, and the statute creating a cabinet-level housing and urban development department as a fulfillment of Kennedy’s promise of hope and progress. In addition to these legislative memorials to Kennedy’s vision for a more prosperous and peaceful world, his mother, Rose Fitzgerald Kennedy, commemorated the life of her son at his birthplace in Brookline, Massachusetts. Photo by Richard W. Sears. John Kennedy’s parents, Joseph P. and Rose Fitzgerald Kennedy, were both members of politically prominent Irish Catholic families in Boston. Joseph Kennedy bought the nine-room, Colonial Revival style house at 83 Beals Street in Brookline, a streetcar suburb of Boston, shortly before his marriage to Rose Fitzgerald in 1914. The Kennedys’ second son, John Fitzgerald Kennedy, was born in the master bedroom, on the second floor, on May 29, 1917 and spent the formative years of his childhood in this middle-class neighborhood. Here Rose Kennedy instilled in her children a commitment to personal cultivation and public service with piano lessons in the parlor, political discussions around the dinner table, and edifying tales of adventure in the nursery. Two servants, who lived on the third floor and whom Mrs. Kennedy supervised from her second-floor study, accomplished most of the physical labor in the kitchen, allowing the Kennedys’ to lavish time and attention on their growing family. 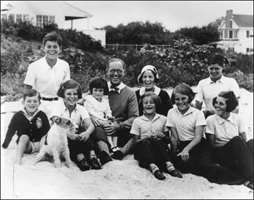 In 1920, with the birth of their fourth child, Rose and Joseph Kennedy felt that the family had outgrown the Beals Street house and moved nearby to a larger home, where they lived until they departed for New York in 1927. John F. Kennedy entered Harvard University in 1936. In 1940, he graduated with honors in political science. His senior thesis, published under the title of Why England Slept, became a bestseller. Following graduation, he attended Stanford University Business School for six months. Kennedy joined the Navy in the fall of 1941 as an ensign. After the attack on Pearl Harbor, he commanded a PT boat in the South Pacific. When a Japanese destroyer sank his boat in 1943, he helped his crew reach safety in spite of his own wounds and chronic back pain. His actions earned him the Navy and Marine Corps Medal. Kennedy worked briefly as a reporter for the Hearst newspapers after his military discharge in 1945. Covering the formation of the United Nations at San Francisco, the Potsdam Conference, and the British elections whetted his appetite for politics. Elected to the United States House of Representatives in 1946, he easily won reelection in 1948 and 1950. Two years later, he defeated long-term incumbent Senator Henry Cabot Lodge, Jr. The next year, Kennedy married Jacqueline Bouvier. In 1955, he wrote the Pulitzer Prize-winning Profiles in Courage, while recuperating from back surgery. In 1956, Kennedy narrowly lost a bid for the Democratic vice-presidential nomination. Two years later, he overwhelmingly won reelection to his seat in the Senate. In 1960, the Democratic National Convention selected him as its presidential candidate on the first ballot. Senator Lyndon B. Johnson, his principal rival for the nomination, accepted the vice-presidential nomination. Americans watched Kennedy face the Republican candidate, Richard M. Nixon, in the first televised presidential debates. Kennedy won the general election by a very small margin. The Cold War dominated Kennedy’s brief presidency, as it did that of his predecessor, President Eisenhower. Soon after his inauguration in 1961, he supported a group of anti-communist Cuban exiles, equipped and trained with the assistance of the United States, in an attempt to overthrow Premier Fidel Castro. The “Bay of Pigs” invasion was an embarrassing failure, and President Kennedy publicly accepted responsibility. 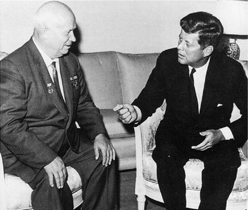 The incident severely damaged American ability to negotiate with Soviet Premier Khrushchev that summer in Vienna. In August 1961, East Germany built the Berlin Wall to prevent its own people from escaping across the border between East Berlin and West Berlin. In retaliation, Kennedy increased U.S. forces in Berlin. Two years later, he endeared himself to West Germans by delivering his “Ich bin ein Berliner” (“I am a Berliner”) speech at the Wall, declaring it a symbol of the failures of Soviet-style communism. The Soviet Union and the United States subsequently enlarged their military budgets and resumed nuclear testing. Responding to communist revolutionary movements in Southeast Asia, Kennedy achieved a negotiated settlement of the longstanding political turmoil in Laos in 1962. That same year, he increased U.S. involvement in the conflict between North and South Vietnam, adding Special Forces units to the military advisers President Eisenhower sent during his presidency. In October 1962, a major international crisis brought the world close to nuclear war. Kennedy obtained aerial photographs showing that the Soviet Union had placed intermediate-range missiles capable of striking the United States mainland in Cuba. In an emergency telecast to the nation, Kennedy announced that the U.S. Navy would quarantine any shipments of offensive arms to the island until the Soviets removed the missiles. The tense confrontation ended when Khrushchev backed down. The period after the “Cuban Missile Crisis” saw significant progress in improving Soviet-American relations. In 1963, Kennedy signed the first arms-control treaty of the Cold War with the Soviet Union and Great Britain, banning aboveground nuclear testing. He also agreed to the installation of a "hot line" for instant communication between the White House and the Kremlin. Kennedy brought new optimism and idealism to politics, particularly among young people. His Alliance for Progress and Peace Corps extended that idealism to helping developing countries. He succeeded in getting Congress to pass many elements of his "New Frontier" domestic program, including aid to higher education, increases in the minimum wage and Social Security benefits, urban renewal, and aid to economically distressed areas. His policies ushered in a sustained period of economic growth and set the stage for major reform initiatives, including the establishment of the cabinet-level Department of Urban Affairs, the provision of medical care for the aged under the Medicare program, federal assistance for public schools, and stronger regulation of farm production, that were enacted under the leadership of President Lyndon B. Johnson. Though initially cautious, Kennedy made notable gains in civil rights. During his first 100 days in office, Kennedy established the Committee on Equal Employment Opportunity to eliminate discrimination in federal hiring, instructed his cabinet secretaries to expand opportunities for African Americans in every department, and renewed the Civil Rights Commission. Increasingly moved to moral outrage by Southern resistance to court-ordered desegregation of public schools and facilities, President Kennedy, together with his brother, Attorney General Robert F. Kennedy, enforced the Supreme Court’s directives. In 1962, Kennedy sent U.S. marshals and troops to ensure enrollment of African American James H. Meredith in the University of Mississippi. In 1963, Kennedy federalized the Alabama National Guard to prevent violence during integration of the last segregated State university in the nation. During a televised address June 10, 1963, President Kennedy reminded the nation that “for all its hopes and all its boasts, [it would] not be fully free until all its citizens are free” and called for commitment to the “proposition that race has no place in American life or law.” The following week, Kennedy presented Congress with a civil rights bill which would ensure voting rights and eliminate discrimination in all places of public accommodation, a proposal for racial justice later enacted under the Civil Rights Law of 1964 and the Voting Rights Law of 1965. In the fall of 1963, Kennedy toured the nation to build support for administration programs and his reelection. On November 22, 1963, an assassin shot Kennedy as his motorcade passed through downtown Dallas, Texas. The president died a few hours later and, while the whole world mourned his passing, his reputed assassin, Lee Harvey Oswald’s own murder shrouded Kennedy’s death in allegations of conspiracy. The nation responded to the tragedy with thousands of memorial tributes to the slain president, but the most intimate remains the Kennedy family’s memorial at his birthplace. In 1966, the Kennedy family repurchased the house on Beals Street; Rose Kennedy enlisted decorator Robert Luddington of the Jordan Marsh retail store, to help recreate the home’s 1917 appearance. Working from her remembrances, Mrs. Kennedy and Mr. Luddington assembled and arranged household furnishings, photographs, and significant mementoes in the principal rooms of the house. 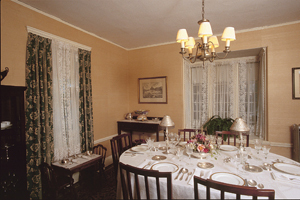 Mrs. Kennedy’s personal reminiscences continue to guide visitors through the home. John Fitzgerald Kennedy National Historic Site, a unit of the National Park System, is located at 83 Beals St., Brookline, MA, a residential suburb. The birthplace has been designated a National Historic Landmark. The grounds are accessible year round; the house is open to the public seasonally. Entrance to the Visitor Center is free; a fee is charged for visiting the house museum. For additional information, directions, and the seasonal schedule, visit the National Park Service John Fitzgerald Kennedy National Historic Site or call 617-566-7937. Visitors can also enjoy self-guided walking and special ranger-led tours of the neighborhood where Jack Kennedy spent his childhood. The John F. Kennedy Presidential Library & Museum is located nearby in Boston. 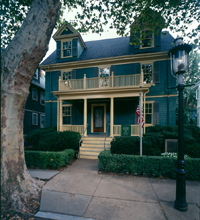 The John Fitzgerald Kennedy National Historic Site has been documented by the National Park Service’s Historic American Buildings Survey. 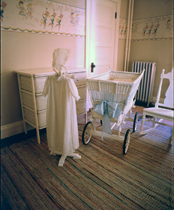 The home is the subject of an online lesson plan, Birthplace of John F. Kennedy: Home of the Boy Who Would Be President. The lesson plan has been produced by the National Park Service’s Teaching with Historic Places program, which offers a series of online classroom-ready lesson plans on registered historic places. To learn more, visit the Teaching with Historic Places home page.